Congratulations to our Sitamarhi Clinical Outreach Team, who have been recognized by the Government of Bihar for their outstanding work in health and family welfare. 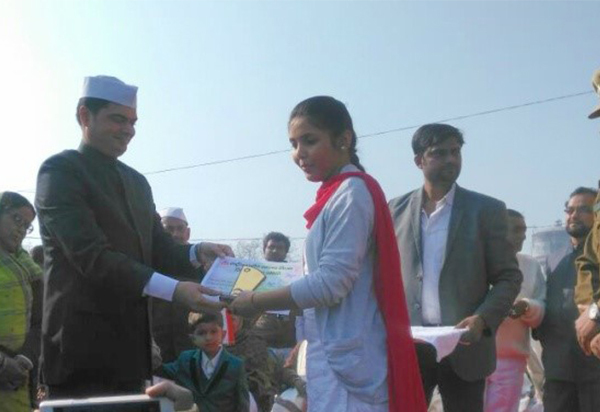 As part of Bihar’s Republic Day celebrations, the team was presented with an award for their contribution to the delivery of high quality family planning services. Alongside the team award, Mr. Prince, Program Coordinator and Ms Juhi, Counsellor were also recognized for their contribution in this area. The team serves two districts- Sitamarhi and Seohar in the state of Bihar. In 2017, they provided services to a total of 5,494 clients (4,260 female sterilizations, 57 male sterilization and 1,177 (IUCD) in the two districts. FRHS India is honored to have received such recognition and would like to thank donors, partners and well-wishers for their continued support and encouragement. One of the things that FRHS India is known for is our dedication to getting services through to the last mile. 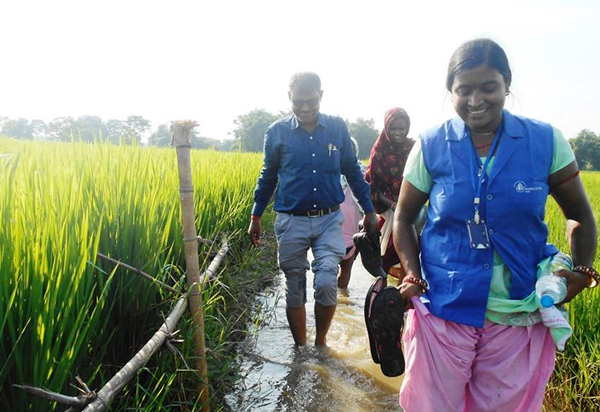 So when communities in the state of Bihar were cut off by record-breaking floodwaters, our teams knew what they had to do. In 2016, the monsoon floods of India’s Ganges river broke all the previous records, in places reaching more than 50m (166ft). Bihar state was particularly badly affected, with more than 150 deaths and nearly half a million people evacuated. A small outreach team comprising Nurse Rani Kumari, Counsellor Chandan Bharti and Programme Coordinator Chandra Bhushan organised for a narrow wooden raft to carry them across the flooded areas towards the Araria district, where local women had been unable to access contraception services for more than a month. That wasn’t the end of their journey. Once they had crossed the flooded area, the team walked for more than an hour to reach the health centre at Mirzapur. In places, they were forced to wade through knee-deep slush, physically carrying all the required equipment for the day’s procedures. In total, the team travelled a distance of 25km over three hours – an extraordinary effort. As soon as the local women learnt of the team’s arrival, they quickly lined up for services. The team provided 14 women with IUDs that day, giving them long-acting protection against unplanned pregnancy, come rain or shine. Pinky joined the partnership in 2010, aged just 22, when she was assigned the role of counselling women on their contraceptive options in the remote Rajasthan townships of Sanganer and Bassi. At first, the work was tough – many of the women Pinky visited had received little education and were unused to making decisions, deferring instead to their husbands and community elders – but she persisted. It took time to gain the women’s trust, but gradually and with some determination, Pinky encouraged them to share their concerns about family planning more openly. She realised that most of the women she met understood the value of being able to manage the size of their family, but were constrained by factors like the distance to their nearest health clinic, or family commitments taking priority. By adopting the client-centred approach that FRHS India, formerly Marie Stopes India is known for, Pinky was able to not only understand the challenges her clients faced in accessing contraception but offer them solutions. As a result, uptake of contraception in the townships began to rise. In 2013, FRHS India began a focused drive to increase the number of men coming forward for vasectomy. Having already won the confidence of the women in the community, Pinky was well-placed to promote the procedure among their husbands and male family members. However, her initial efforts were met with resistance, sometimes even with gossip and mockery. Once again Pinky persisted, continuing to face the communities she visited with courage, addressing the myths surrounding the procedure, and explaining the method to the men with as much ease as she had to the women. Gradually, the men of Sanganer and Bassi realised that what she was telling them not only made sense, but was to their benefit. Increasing numbers started coming forward for vasectomy. Pinky’s biggest achievement came in November 2014, when she encouraged 32 men to undergo a vasectomy on a single day. Pinky has been so successful in her work that she now plays an important role in generating demand for vasectomy in almost every district in Rajasthan, India’s largest state. In her new role as Block Coordinator, she heads a team of 14 peer motivators, who she trains to motivate men across the state to take up vasectomy. In addition to training others, she continues to meet clients of her own and looks forward to breaking her own record soon! Bairgania is one of the blocks in Sitamarhi district which borders Nepal. The road to Bairgania is not much of a road and last year’s flood has further worsened the conditions of the navigable road. While political parties have been promising reconstruction of the roads, residents there might have to wait for a little longer. However, this does not deter FHRSI’s Clinical Outreach Team (COT) to continue with the Fixed day Services. “FRHSI has been delivering services in our area for several years now, the team is extremely efficient and respects our needs,” shared Geeta Devi, a mother of 5, who had come for Tubal Ligation as she is certain that her family is complete. FRHSI is committed to providing family planning services to each and all and always puts clients’ needs at its centre of all operations. Quality of Care is a non-compromising issue and teams across regions ensure that utmost care is taken while addressing clients’ needs. The Fixed Day Services are a life saver for many families in Bairgania block, as families are keen to access family planning services, especially long term measures, so that they can attend to their children efficiently. “I always wanted a smaller family, but I wasn’t aware of family planning services. We have 7 children and my husband works as a labourer in Delhi; now due to our large family we face a lot of financial constraints. Had I known of these services earlier, we could have managed the pregnancies better,” said Kamla, a client who had come for Tubal Ligation. Kamla is not alone, the unmet FP needs, especially in far flung areas such as Bairgania is enormous, and bridging the gap is what FRHSI is striving for with every passing day. There are very many misconceptions and stigma attached to Non-Scalpel Vasectomy (NSV) and FRHSI addresses all such misconceptions and taboo through sensitisation, advocacy and relentless conversations with various stakeholders, especially the MEN. Family planning in India has always been plugged in as a woman’s job; men had habitually been out of any such discussion or dialogues. India’s patriarchal mindset has further stemmed the habit. However, things are changing, and men are increasingly getting involved in discussions around FP services and Sexual and Reproductive Health and Rights. But when it comes to availing long term methods, women have been sharing the load…nonetheless there are men like Ahmad who have not only availed NSV, but also has been actively advocating for it among his peers and community. Ahmad got to know about FRHSI’s NSV COT during a mobilisation activity, “I waited for everyone to disperse, after that I mustered courage to talk to the team,” he shares smilingly, “This is so because, men availing NSV is looked down upon and there is a general perception that it would affect a man’s physical strength, which would have an impact on his earning/employment.” Ahmad is a rickshaw puller by profession. But that was then, he was fully assured by the team and the doctor, post which he went for the services. “The day I got NSV done, was quite dramatic, I came riding my rickshaw, much to the worry of the NSV COT team, as they did not want me to ply the rickshaw on my return after the services. However, after the procedure, I did not feel a thing; in fact I was ready to sit on my rick after the stipulated post- operative time and after the team had given me a clearance for discharge. Not only did I ply my vehicle, I got two more of my friends within the next 30 minutes to the CHC,” he shares enthusiastically. He further shares that his intention was not to pull a stunt, but wanted to grab eyeballs and address naysayers. Ahmad single handedly, has managed to influence at least 10 of his friends for the same. Not all heroes wear capes! Raghu, another NSV client shared that “In our community NSV is not common, but I wanted to share the burden.” Raghu, however was not as happy as Ahmad after his services, he was suffering from dilemma. As a security guard, he is expected to man a telecom tower all through night and had caught a cold, “On my first night of duty after NSV, I felt chills, and I thought, people were right, NSV does reduce your stamina! But then when I started having runny nose, I realised that I caught a cold..and was unnecessarily feeding onto a myth.” He shares a hearty laugh narrating his experience. While the number of men participating in family planning is still abysmally low, things surely and certainly are changing..and FRHSI in each step is guiding and addressing apprehensions and myths to break the taboo. Reaching out with crucial family planning services and sensitising on SRH is at the heart of FRHS India’s service delivery models. FRHSI is committed to reaching out to the poorest of poor and the most vulnerable. Giving non-discriminatory quality services is one of the key deliverables for FRHSI. Family planning is a huge challenge for the specially-abled, as many a times; they are not able to access the Community Health Centres (CHC) or the Primary Health Centers (PHC) due the lack of infrastructure. Their needs are often neglected and brushed aside, leaving them with little choice to exercise their reproductive rights. In order to ensure that all men and women have access to FP services in FRHSI service delivery areas, and are able to achieve their reproductive goals, teams ensure confidentiality, quality and work with great enthusiasm. “There has been many instances where specially-abled persons, persons with hearing impairment, visual deficiency and affected by polio had reached out to ASHAs (Accredited Social and Health Activist), with whom FRHSI works very closely for FP services. We took utmost care for all our specially-abled clients, and ensured that they receive services in a dignified manner,” explained the Sitamarhi COT members. Family planning needs of people living with disabilities are often overlooked and seldom prioritised. Across the world, people living with disabilities have poorer health outcomes, among other issues than people without disabilities. This is partly because people living with disabilities experience barriers in accessing services, information etc. At FRHSI, the aim is to reach out to the most vulnerable and teams across regions ensure that dignified services are offered to each and all. FRHSI has pioneered the ‘9 steps to quality service delivery’ and it encompasses all. In the month of December, 2018, the Accredited Social and Health Activists (ASHA) had gone on a total strike across the state of Bihar. The ASHAs demanded fair pay and infrastructure, often the last mile champions like ASHAs and ANMs (Auxiliary Nurse and Midwife) have to face various constraints to support and fulfill ambitious government schemes. The ASHAs in Bihar stirred to demand fair pay and had stopped their activities in December 2018. Our work depends quite a lot on ASHA’s mobilisation at grass roots especially for our Fixed Day Services. The ASHA didis working with FRHSI has been associated with the programmes for many years and are motivated to help us liaise with clients. “Being an ASHA, we had to show solidarity with all the ASHA workers, but we knew that if there is a total shutdown, many deserving and vulnerable clients will be denied of crucial family planning services,” shared an ASHA worker. The commitment and the passion to deliver quality services to ensure that families could have ‘Children by choice, not Chance’ is absolutely commendable. The ASHA stir did have some impact on FRHSI’s service delivery, but overall due the on-ground resilience and dedication clients at the majority of districts and blocks in Bihar were served.